Thanks for the recent suggestions all. I'll take them onboard and you may see some of them in ReEQ in the future, time permitting. Appreciated. Regarding the ReaEQ rendering issue (now spotted on Facebook). I've messaged Justin to see if he's got any idea what might be causing that. I think it is only a rendering state issue, it doesn't affect audio as far as I can tell. I'll need to allocate some time for a really good debugging session in order to reduce down to what's causing it. Expect a fix or at least a diagnosis soon. Hi All & Particularly Nitsuj who has created this fantastic plugin. Ive been using it for the past week or so & it's just great...I'd go so far as to say it's "Fab" (wink, wink). One request I have is, would it be possible to keep the fader controls from the original reaEq? I find them really handy when it comes to pulling out frequencies once they've been identified. Just grab the fader & pull it down (no shaky hand to contend with). Thanks for such a great plugin, your work is greatly appreciated. I've literally been playing with this for the last 10 minutes on my works laptop, using the internal speakers and I can still hear the nuances of the EQ. Can't wait to get home and put it into a mix on my real system. not to stop the spectrum analyzer when opening any menu/option inside the plugin? to have smoother lines? Both in the eq and in the spectrum analyzer. The line display is nice though! It would be lovely to have that kind of smothness everywhere. to add another option to the spectrum analyzer to have both fill and line (settings > display)? reset the dry/wet control at the bottom by double-clicking? add a few extra options for the limit button? add an option to use a keystroke to be able to not move the mouse cursor while addingg or reducing the gain of a single band? Am I a masochist if I spend the next hour EQing a metal snare drum with this? OMG I'm having fun here. Even enjoying high passing some guitar tracks and the resultant sound is massive! to have smoother lines? Both in the eq and in the spectrum analyzer. The line display is nice though! It would be lovely to have that kind of smoothness everywhere. Running the analyzer concurrently when the menu displays is something I don't have control over in JSFX. Hands are tied on that one. Smoother lines would be great. I develop on Mac so on that platform it uses retina and it looks really smooth. Admittedly less so on non-retina. I have tried to hack some kind of poor mans anti-aliasing but it doesn't alway work well. What's really needed is for Cockos to implement anti-aliasing for their line drawing (and other primitive) functions in JSFX. I'll think about the fill and line option. At one point I thought I had implemented double clicking to reset the bottom parameters. I'll see about sorting that out. What options are you thinking about for the limiting? The main purpose is to brick wall limit so that you don't get excessive volume. It's not intended to be a limiter for using in a musical capacity. In my build I've already added frequency and gain lock for moving a filter node, so that'll be released soon. Your suggestion would take a little more work as there's currently no concept of a selected filter node except when the mouse is over it. The moment the key press altered the gain, the mouse cursor would no longer be over the filter node and so it wouldn't be selected any more. I'll give it some thought though. Other than that, I'm adding extra filter types, improving solo/listen mode and improving node dragging amongst other smaller fixes and improvements. Ok great stuff, as always! For the limiter I guess you’re right. Maybe showing better when the limiter is turned on/off? Right now the box background color changes, so you have to know what each color means, which is a bit unintuitive. One last thing I just realized would be awesome would be the ability to select bands by dragging the mouse. As it happens with Nova by TDR. I can’t wait to try the first complete version of your plugin dude! Smoother lines would be great. I develop on Mac so on that platform it uses retina and it looks really smooth. Admittedly less so on non-retina. I have tried to hack some kind of poor mans anti-aliasing but it doesn't alway work well. What's really needed is for Cockos to implement anti-aliasing for their line drawing (and other primitive) functions in JSFX. ...I assume you know that line and lineto and other primitive functions (circle, roundrect, arc, etc) do have optional anti-aliasing in JSFX on windows/linux? Curious what you meant here? Sure, I wasn't clear enough. In ReEQ the only normal width lines are the Bode grid lines. All the other lines need to be wider in order to look ok. So...the real problem isn't AA on its own per-se, it's that there's no inbuilt function to draw thicker lines and make them look ok. If you have AA off, they look too pixelated and if you have AA on, thicker lines look blurred because you have to draw multiple lines yourself and the AA overlaps. The AA I was talking about trying to hack was drawing a line then drawing darker lines (using alpha) either side of it to make it thicker but smoother. Of course, you have to account for lines that are biased more towards vertical or horizontal and the whole idea starts to feel like a bodge (which it is!). So, I guess my request for JSFX would be the ability to specify line thickness (for lines, rectangles, circles etc) with AA that handles correctly. Extra nice if thicker lines (optionally) terminated in half circles to round them off. Yeah, this would be a really nice feature. I've noticed the same. It's very hard to get nice anti-aliased lineshapes with stuff that needs to be wider than 1px. Usually I draw the 'core' at full alpha and no antialias, then draw the corners again with antialias. I have noticed though that it is really important to round the line coordinates down or up to full pixels when doing this, otherwise you get a mess. And I have also noticed the sensitivity to integer-vs-not parameters to graphics functions. Also recently found a very tiny bug in JSFX line drawing. It only adds latency in oversample x2 mode. ...It's the way Reaper's ReaEQ works and also the way that Ableton's EQ8 works. Sorry for the rather off topic question but are you sure that ReaEQ employs oversampling of any kind? I was pretty sure it did not and hence its lack of latency. 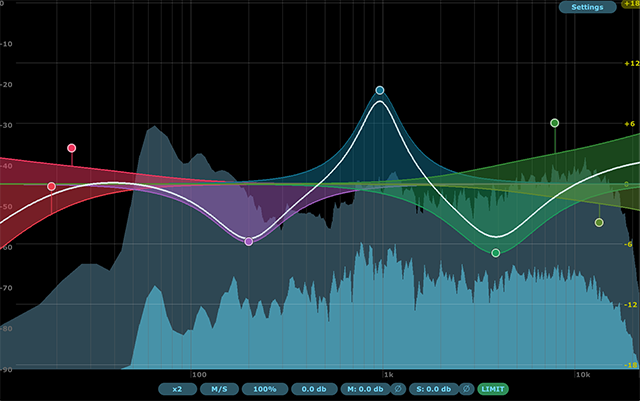 Awesome EQ. Thank you so much for providing this for free! This eq seems to preserve transients very well (no smearing that I could detect/less smearing than other eqs I have). In this regard it out performed both reaeq and TDR Nova on ryhthmic material I tried it on. In one particular comparison it was the only eq that didn't destroy the 'feel' of a drum groove I was working with. Is there something different from usual going on with phase? I'm surprised you'd find it replaced NOVA as that's a parallel EQ in the first place. I'll have to try that myself! I've been following this with much interest and have been meaning to download this and give it a run. My studio is undergoing some renovations at the moment though so I haven't had a chance to run this yet. Is the zip file in the first post the latest version? Thought I'd share this with you. It's a couple of pet projects I've been working on for fun recently. My question was: is it possible to create a FabFilter or EQ8 style high quality filter in JSFX? This is an eight band filter. It defaults to oversample x2 so that the filter shapes are preserved near Nyquist but no oversampling is also an option. When oversampling, there is a 16 sample delay introduced and it uses a steep FIR filter at high frequencies to remove aliasing. It's highly transparent in either case. The filter code itself is based on Andy Simper's (Cytomic) SVF filter algorithms. They are far higher quality than the usual RBJ cookbook filters. These are the same zero delay filters used in Ableton's EQ8 which is well regarded for its high quality. In addition, I've provided 6db slope filters and increments of 6db thereof (a combination of one and two pole filters) with cutoff slopes for high and low of up to 96dB. I've also provided Butterworth filters for steeper (but more resonant) slopes. Full mid/size or left/right stereo filter bands are implemented. Feature wise I see it as an improvement over ReaEQ (more filter types and slopes, mid/side or left/right processing). - The spectrum display type has a gradual decay effect (as used by many other commercial EQs). I find this much more useful for musical applications. - The 'Settings' menu at the top allows various spectrum display settings to be adjusted. That's which spectrum to show (mid/side/left/right etc), whether to fill the spectrum or use lines, the ceiling and floor range, the tilt of the spectrum (it tilts around 1k freq), window type, window size and whether to show the spectrum as it was before the EQ affected it. - The buttons at the bottom are: Oversample mode, mid/side or left/right mode, the scale of the filter bands, total gain, mid/left gain, side/right gain. The numeric values are altered by clicking on the button and dragging the mouse up or down. - Double clicking in space creates a filter band node. Depending where the mouse x is on the spectrum you'll either create a high pass, low shelf, peak, high shelf or low pass filter. - Click on the filter band node and move mouse to alter it's frequency and dB. - Alt Double click deletes a node. - Double clicking on a filter band node will toggle enable/disable. - Hovering over a node and using the mouse wheel will adjust the filters Q value. - Command (Mac) or Ctrl (Windows) and mouse wheel hovering over a slope filter will adjust the slope dB. - Right click over a filter band node will bring up a menu. Options are: Disable/Enable, Select shape of filter, dB of slope (only for high/low pass filters), Stereo placement (mid/side, left/right), Split node which will split the node into mid/side or left/right and delete. - When a filter node is in mid/side or left/right mode, some triangles are displayed around the node to give an indication of such. - Clicking on the top-right yellow EQ db number will show a menu allowing to select the EQ range from 6dB - 36dB. - The info box at the bottom left will show useful information such as the frequency of the mouse position or node (if hovering over one), the music note and cents, dB of mouse or filter, filter Q and filter slopes. - The drawn view scales to fit the full window and when the mouse isn't hovering over the window the programs turns off distracting menus and node handles. - The same 'Settings' options as ReEQ. - 'keys' button toggles a piano roll. Hover over the piano keys to see a vertical beam to pinpoint spectrum frequencies. - 'peaks' button toggles the spectrum display of maximum peaks. - I've only tried it on OSX as I develop on Mac. - It should support both retina and non-retina displays. - Only the first five filter bands are exposed as sliders for automation. - You'll need a reasonable machine performance wise. Closing the window when not in use helps. - I've used showmenu() for the menus. Technically it's not documented for JSFX so I don't know how well it works on other platforms. - Oh, I should say I borrowed Theo Niessink's RBJ filter code but only for the display magnitude calculations, not for sound processing. I've attached a zip file which can be unzipped to your Reaper effects directory. I'd consider using ReaPack if there was a call for it. * Band nodes have improved selected and dragging visual. * There's a toggle for a crude hard brick limiter. It's here as a safety net. * Added 'None' option for spectrum display. * Minor font fixes - still some to do. * Fixed oversampling issue. Oversampling correctly ignored for sample rates > 48kHz. THE TALENT ON THIS REAPER FORUM IS MIND BLOWING! WHAT A GENEROUS GROUP ! Everything I Need to Know about Reaper, I Learned from Kenny Gioia. Would it be possible to report zero latency when OS is switched off? I was referring to the cramping near Nyquist. In that both ReaEQ and Ableton EQ8 exhibit that by default (although EQ8 has a HQ oversampling mode - that introduces latency). Apologies if I wasn't clear enough. Yes. I'll be keeping that as the latest until I'm happy with putting it into ReaPack. There's a bug in Reaper's JSFX handling which doesn't update the PDC value. I think it's documented somewhere in this thread. To get around it toggle ReEQ to 'offline' and then back 'online' again after you've set oversampling to x1. That sorts it out. Clear enough now! Thank you! To everybody working with tracks recorded at 88 kHz or higher SR: you don't need to turn oversample on! There's a new update of ReEQ available. Zip file and instructions + changes on first page as usual. The biggest addition is a proper listen/solo mode engaged by holding SHIFT. When a filter node isn't selected you can listen to a range of the spectrum and hold click and move vertically to audition that range at different volumes. When a filter node is selected and shift is held then you get to solo the relevant audio for that node. For example, a peak filter solo'd gives you the spectrum range of the filter + the peak filters affect on the audio within that range. Soloing a low cut or high cut filter will let you listen to what you're cutting out as that is of most interest. There's also two new filter types. There's a tilt filter with an adjustable slope via the Q setting and there's a Pultec style low shelf. The latter filters are characterised by having an adjustable dip just below the shelf - a handy technique for eqing bass. This dip can be accentuated by altering the filters Q and naturally becomes deeper as the shelf is boosted. Is not supposed to be any kind of accurate curve replica but it's a handy shortcut for this technique. As requested there's a frequency and gain lock. Check the instructions for details. Wow! Amazing! It keeps getting better and better! Thank you! nitsuj, just out of curiosity: why won't you compile a VST version rather than staying at JSFX? Who knows, I might do at some point. In the meantime I think it's a useful showcase of what JSFX is capable of (along with the other brilliant JSFX that people create) and what it could be capable of if COCKOS continues to develop it. There's so much potential. A great benefit of JSFX is that you can edit the source code right inside Reaper if you like to make tweaks and adjustments or even create a new version of it - if you're inclined towards programming that is. Come a new day and I'm having second thoughts about it... it's probably a better idea to stay in JSFX for many reasons: pushing the programming-language forward, as you say, giving it some value rather than moving onto VST like everybody else, and even keeping something REAPER-exclusive! It's your own decision of course. Thank you! This is absolutely amazing work! Well done. There's some weird bug though that seems to change the frequency response on playback.. even when I have no EQ nodes in the plugin at all. It's like some weird filtering is happening and after a while it gets worse. Not sure what is going on. Was running the project at 48kHz and all default settings on the plugin. Will try to investigate tomorrow. Thanks for the feedback. I'll take a look. Thanks for the updates! Love this EQ! Just tried it. I created two tracks with audio, one containing ReEQ. The other with no plugins but reversed polarity. So essentially a null test. At 44.1kHz they null perfectly but at 48kHz there's some low frequencies. I'll get onto a fix straight away. Thanks for spotting. The image of the saw is fixed with Reaeq. But I don't know about it it's Reeq update or Reaper update, but everything is O.K. A small suggestion; the eq point should be bigger if possible, so that we can keep it easily. Fantastic, thanks. Working on linux for me. It reminds me of overtonedsp's AF210/M which is my go-to. Essential bug fix update for anyone that downloaded the Feb 26th features update. I'd (accidentally) left a line of code always enabling filter band 0 for testing purposes. It was causing all sorts of puzzling side effects. Fixed now. Tested yesterday ReEQ and it did sounded different without adding any filter nodes. Thanks for the update. Now it's ok.
1. Could ReSpectrum get multiple inputs so that we can visualize different sources in the same window? 2. Can you add to the ReEQ & ReSpectrum, "average time" like in SPAN? Last edited by AndreiT; 03-01-2019 at 04:03 AM. Wow, this is amazing thanks nitsuj! I saw elswhere that you were workign on some other scripts you may be thinking about realeasing, wondered if there was any news there? Thanks a lot for this great eq nitsuj. Is it available on reapack? Didn´t find it. Not yet but it will be.